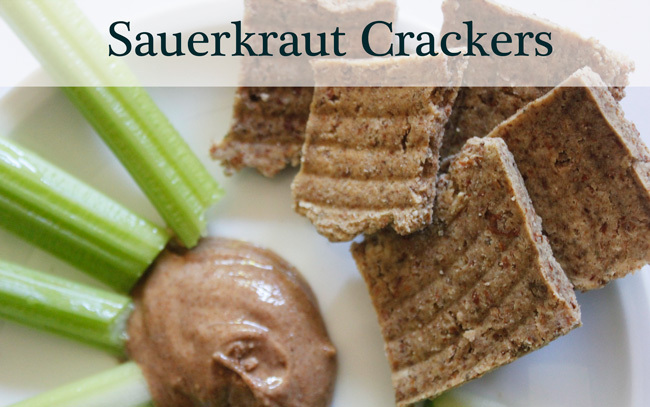 The other day I picked up a box of sauerkraut crackers at my local health food store. I know that doesn't sound very appetizing, but sauerkraut is really, really good for the stomach and I'm on a mission to heal mine after long-term antibiotic use. I was intrigued by the fact that they were gluten free, raw-food quality, and that even in German I could understand the ingredient list: sauerkraut, almonds, caraway, chia seeds, hemp seeds, flaxseed and pumpkin seeds. The crackers were slowly dehydrated at 42c and therefore retained their nutritional value. Having just purchased a dehydrator, and inspired by Carrie's take on carrot crackers, I set to work. I was so pleased with how they came out! They're like a less salty (and much healthier) version of a Triscuit. Even better, I feel really good knowing that I made a snack that contains no sugar or grain and is beneficial for the stomach. Put all ingredients into a high powered food processor and mix on high until it turns into a playdough texture. Spread evenly onto whatever you use for your dehydrator (I can just spread directly onto mine), and dehydrate at 42c (107f) for 8 hours, then flip and dehydrate for 2 more hours. Store in an air-tight container in the fridge and eat for up to a week. Try them with raw zucchini hummus!